#1 The most obvious reason is to do with your child’s imaginative play, vocabulary, memory, and story-telling skills. Of course, these are not the only toys that develop these skills but if you have succumbed to them, you may as well console yourself that there are genuine benefits! They are great for all of these things though. The range of story lines and characters are endless and your child’s ability to re-purpose other toys to add into the story lines is also very good for symbolic play development. Language is all about symbols and if your child can use the LOL balls to make a train or a carousel or a boat, this is very good for play and ultimately, language development. Play is also great for working out things that might be bothering them at school or limits that have been set at home. It’s very useful emotionally to have a baddie in your story that you can vent some steam through without actually hurting anyone! Story telling is also very good for language development and learning to read. As for vocabulary, we have had endless discussions about the following words: opposites, club, sugar, spice, angel, demon. So you have concrete vocabulary like club and then more abstract terms like angel and spice when talking about a character as opposed to food. This is building your child’s vocabulary network in terms of multiple meanings for words. Strong vocabulary is linked to learning to read so it’s a neat way of building a diverse vocabulary. We’ve also had great chats about concepts such as worth and value. As in, is the big glitter ball worth the €65.34 and the 22 weeks it will take you to save for it? Other concepts we’ve explored are terms like ultra-rare, popular, and common. And manipulation, supply, and demand, duplicates. My little girl got Kitty Queen who is, according to some people like gold dust because she’s ultra-rare. However, she’s not interested in Kitty Queen; she prefers Kicks who’s popular. So we talked about the value you attach to something. (On a side note, I discovered I could have sold the infamous Kitty Queen for £85 or more because of the value attached to her by a lot of people.) We’ve also talked about word play when we see the names of some of the dolls like M.C. Hammy, Hoops D.O.G.G. and Curious Q.T..
#2 The second reason LOL dolls are actually a good thing has to do with your child’s emotional development, emotional literacy, and resilience. How so? When you buy an LOL doll, you don’t know which one is inside. We were very lucky initially and never got a duplicate. But that day came and we had only opened the first layer of plastic (I know, I know- 7 bloody layers!) and got the little clue so she knew it might be one she had already. And so it was. Cue hysteria! Oh she railed against those dolls and declared she never wanted to see another one (‘Oh please, yes’ I thought! And then ‘Although she’d better play with the ones she has after all the money I’ve spent’.!! ). So because I was on holidays and not exhausted, I found it in me to acknowledge her feelings and say things like ‘It’s really disappointing. You didn’t want Beats again. You wanted Kicks. She’s your favourite. It’s so upsetting when you get a duplicate’. I also had to fend off my well-intentioned mother from chipping in with things like: ‘There are lots of little girls who have no dolls you know’!! It was really interesting though. After a few minutes of intense emotion, she calmed down and about 20 minutes after that she was able to come up with solutions to her dilemma. For example, she could use Beats’ clothes for another doll. She could pretend that Beats had an identical twin or a clone or that Beats was a changeling. This is the whole point of allowing our children to feel what they’re feeling. It allows them to be better problem solvers. And it gives them a safe place to feel what they’re feeling without any pressure to stop it or change it into something we deem more acceptable. They need to feel accepted as they are. If they can’t do that with us, then how can they ever come to feel that they’re okay just the way they are? And that what they feel isn’t something undesirable but something that makes us uniquely human and connected to each other as we all feel these feelings at one time or another? #3 Believe it or not, LOL Surprise Dolls are good for you too! What? Yes! Two reasons- A: they allow you to enter your child’s world, find out what’s important to them, and get to know them better. When you join in and play, you can see what they value, what they’re interested in, what might be bothering them, and be amazed by their imaginations. These are precious gifts indeed. And B they give you an opportunity to teach your child about goal setting, planning, and money. And to be their guide to handling challenging emotions on the journey towards their goal. LOL dolls are an expensive toy at €11.99 each so they’re never going to be a frequent treat. So my little girl decided to save for this one big ball that has 4 dolls in it and a range of accessories. She has identified what she wants- the big glittery ball- the goal. It’s good to know what you want and have a specific outcome so you’ll know when you’re there. Together we have worked out the numbers- it will take 22 weeks to save for it and you can’t buy anything else in the meantime. We’ve had chats about how you could get to your goal quicker (problem solving and generating solutions) – like do more work to earn more money- and she’s working out what exactly she’s prepared to do to get to her goal faster. As it turns out, cleaning the bathroom sink for €1 extra is not one of them! So she’s clarifying her values. It’s going to take her a long time to save the money so she’s having to learn to deal with feelings of longing and struggle and frustration. And disappointment when some of her strategies like asking for her pocket money in advance and I say ‘No’. Or trying to get more pocket money without adding value in the world. (Hard lessons indeed! We’d all like money for nothing!!) This gives me plenty of opportunities to guide her through the feelings, acknowledge them, let her feel them, and move on. This is not easy! Especially when it can start first thing in the morning as the first thing that comes out of her mouth as she tries to get me to give her money to get to her goal faster! It’s so hard not to preach about patience as my mother used to do!! Or get annoyed by the seemingly relentless focus on what she wants. But is gives me great opportunities to put what I’ve been reading and learning into practice and build the muscle of being tuned in and guiding her through the rough seas. 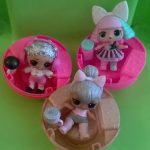 So what are your child’s favorite LOL Surprise Dolls? Be sure and leave a comment below! If you haven’t already, be sure to sign up for fortnightly speech, language, communication, and multilingualism tips direct to your inbox. LOL dolls are obnoxiously expensive. They must be called LOL because I literally laugh out loud when I see the prices of these dolls. If you would like to teach your children and encourage imaginative play, a plain old box and everyday items around the house make more sense. This way, they can use their imagination to use these everyday items in different ways. You can enter your child’s world by simply taking time to sit down with them and taking part in active play. Children are more than happy to have their parents actively listen and interact without overly priced toys. Hi Rai- I agree with you wholeheartedly! Thanks for taking the time to comment.